A labyrinth, unlike a maze, has only one path, winding but branchless, leading from the entrance to the center. Often scratched or carved on Stone Age monuments and grave sites, the labyrinthine design represents the soul’s journey into the center of the uterine underworld and its return toward rebirth. 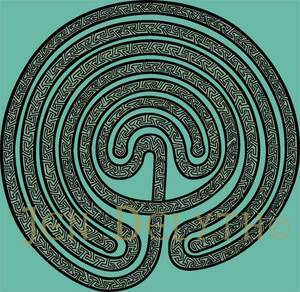 One of the oldest archetypal symbols, the labyrinth is most sacred to the earth goddess. Early labyrinthine designs found on coins, caves and tombs, referred to the earth-womb. Similar labyrinth patterns have been found amongst many different cultures, Celtic, Minoan, Cretan, in Russia, Egypt, India, and in Peru and Arizona in the New World. The Hopi Indians consider the design a symbol for Mother Earth. This design is based upon the Cretan labyrinth, which is at least 3200 years old, known from clay tablets dated to 1200 B.C.. Glastonbury tor - Ynis Witrin - has a maze-pattern similar to such Cretan mazes, created for ritual purposes long before the druids used it in their rites and initiation ceremonies. Inner labyrinth knot-work is a celtic "key Pattern", which is itself a meander symbol, similar to the panels of the ornamented stones of East Pictland from Durham to Caithness, and those in the books of Durrow, Kells, Lindisfarne and other early Celtic manuscripts.